HomeAmerican Frontier: Firearms, Indian, Knives Gros Ventre Fully Beaded Men's Leggings 19th C.
Gros Ventre Fully Beaded Men's Leggings 19th C.
The lot features an excellent authentic set of fully men’s warrior leggings from the Gros Ventre Native American Indians of Northern Montana. The moccasins date to the late 19th Century and show a museum quality construction. The circa 1880 set is sinew and trade thread sewn, a true attribute to its early age. The set show a U.S. Army heavy tent fabric and clothe calico construction with sinew sewn exceptional early period correct glass trade seed beadwork in a fantastic traditional linear geometric design. The beads include such colors as chalk white, cobalt blue, semi-transparent sky padre blue, semi-transparent red, and medium green. The set shows a very fine construction and large size along with little to no bead loss. Each of the leggings still retain the original long hand cut Indian tanned hide tie straps, a welcomed rare addition. 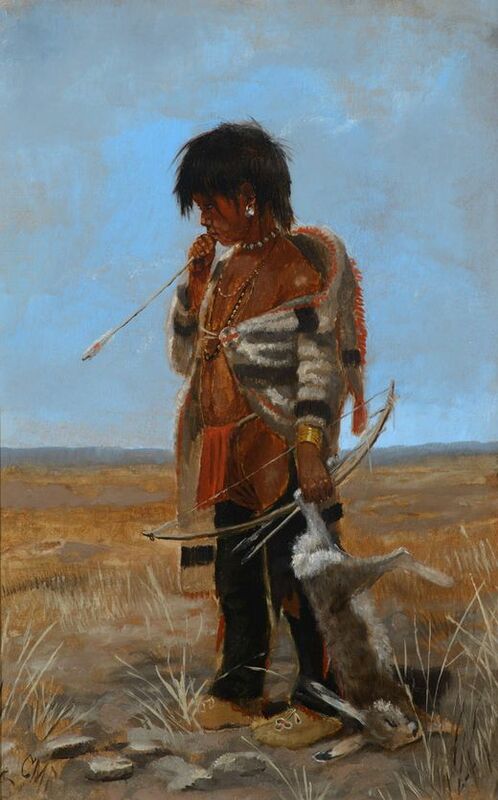 The Gros Ventre Indian tribe (also referred to as the A'ani, A'aninin, Haaninin, and Atisina) are a Algonquian speaking people from the North Central Montana region. The Gros Ventre's migrated to Montana in the 18th Century due to pressure from the Ojibwe Indians. Measures overall 10.5"L sole that is 4.25" across approx. The heel is 3.25"H when elevated. At the end of the belt shows an older green museum collection identification tag that is marked "B.416" and "DJ JJ". Provenance: From a large Native American weapons and beadwork collection in Great Falls, Montana. A similar quality set of Gros Ventres moccasins from the 19th Century was sold for $3,900 at our 8/5/2017 auction. Each legging measures 13"L x 8"W when folded over (when open each measures 15.5"W).